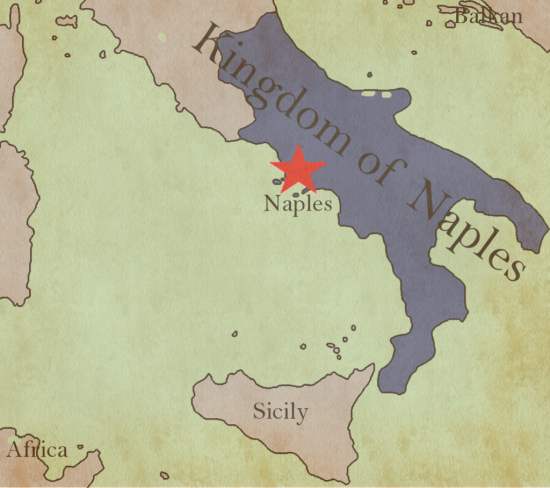 The Kingdom of Naples was created in 1282 as a result of the War of the Sicilian Vespers, where the Island of Sicily revolted and was conquered by the Crown of Aragon. The first King of Naples was Charles I of Anjou, the youngest son of Louis VIII of France and Blanche of Castile. Charles was married twice, first to Beatrice of Provence, who was thus the first Queen consort of Naples. After her death in 1267, Charles remarried to Margaret of Burgundy. Upon Charles’ death in 1285, he was succeeded by his son, now King Charles II of Naples. His father had arranged a double alliance for his son, and so Charles was married to Maria of Hungary, while his sister married Ladislaus IV of Hungary. Charles and Maria would go on to have 14 children. Upon his death in 1309, he was succeeded by third son, now King Robert of Naples. His eldest son had died in 1395 and his second son had become a bishop. The rights of Robert’s nephew Charles were overlooked, he was just a young boy at the time. 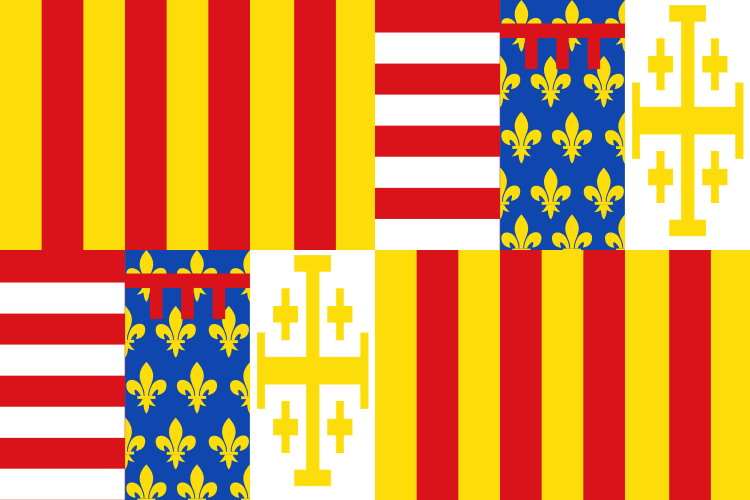 Robert married twice, first to Yolanda of Aragon, with whom he had one surviving son. After her death in 1302, he remarried in 1309 to Sancia of Majorca but had no further children by her. His only son would predecease him, leaving behind two daughters. Naples was now destined to be ruled by a woman for the first time. Upon Robert’s death in 1343, he was succeeded by his eldest granddaughter, now Queen Joanna I of Naples. By then, the young Joanna was an orphan as her mother had also died 1331. 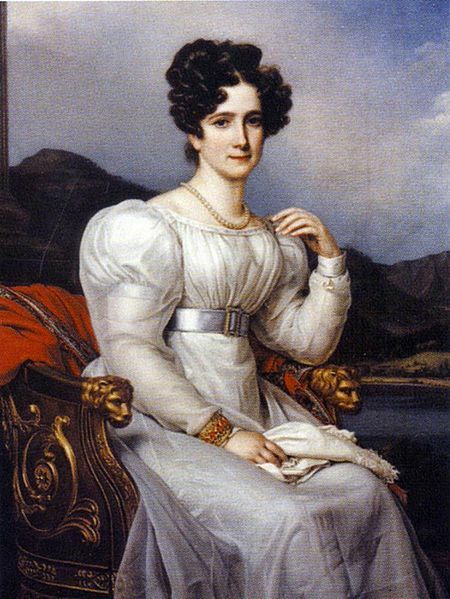 In order to restore the bloodline of Robert’s nephew to the throne, Joanna was married to Andrew of Hungary. 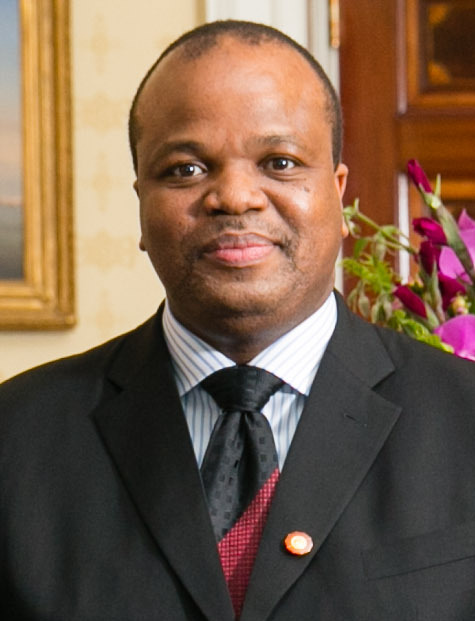 He was given the title of King, but he had little to say in government. Andrew was murdered in 1345, and Joanna gave birth to his posthumous son on 25 December 1345. He lived for just two years. In 1347, she remarried to Louis, Prince of Taranto but the marriage was hugely unpopular. Andrew’s elder brother, who also happened to be the King Hungary, invaded Naples and Joanna fled her Kingdom. In June 1348, she gave birth to a daughter named Catherine. They were able to return to Naples after the King of Hungary abandoned it after an outbreak of the plague. 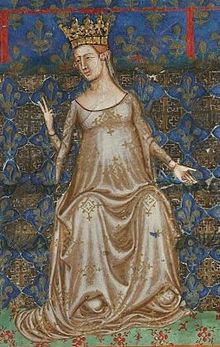 In October 1351, she gave birth to another daughter named Françoise. Both daughters died young, and Joanna never conceived again, despite marrying twice more. Joanna was brutally murdered in Castle of Muro in 1382. Joanna was succeeded by King Charles III of Naples, who was the only child of Louis of Durazzo and his wife, Margaret of Sanseverino. Louis of Durazzo was a younger son of John, Duke of Durazzo who was the youngest son of King Charles II of Naples and Maria of Hungary. He had married his first cousin, Margaret of Durazzo, a daughter of Joanna I’s sister, Maria. They had three children together. He was also briefly King of Hungary until he was assassinated upon the orders of Elizabeth of Bosnia, Louis I of Hungary’s widow, who believed her daughter Mary should be Queen. Upon his death in 1386, he was succeeded in Naples by his son, now King Ladislaus of Naples. Ladislaus married three times. Firstly, he married Costanza Chiaramonte in 1390, but they divorced in 1392 without having had children. In 1403, he married Mary of Lusignan, but she died the following year. In 1406, he married Mary of Enghien, but they too had no children. Upon his death in 1414, he was succeeded by his sister, now Queen Joanna II of Naples. At the time of her accession, she was 41 years old and had already been married to William, Duke of Austria, who died in 1406. On 10 August 1415, she married James II, Count of La Marche but they would have no children. 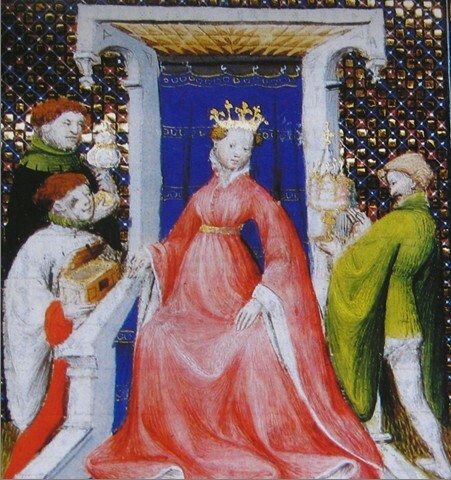 As she had no direct heir, she named René of Anjou as her heir. He became King upon her death in 1435. René was married twice. First to Isabella, Duchess of Lorraine, with whom he had ten children, though not all would live to adulthood. After her death, he remarried to Jeanne de Laval in 1454, but they had no further children. His daughter Margaret would go on to marry Henry VI of England. 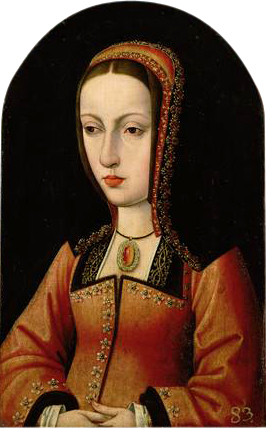 René was ousted from Naples by Alfonso V of Aragon, who Joanna II had also considered as her heir. Alfonso was married to Maria of Castile but they had no children together. Upon Alfonso’s death, he was succeeded in Aragon by his brother, now King John II of Aragon but he had petitioned the pope to allow the Kingdom of Naples to pass to his illegitimate son. He became King Ferdinand I of Naples, In 1444, Ferdinand had married Isabella of Clermont, who also happened to be a granddaughter of Mary of Enghien, through her first marriage. Ferdinand and Isabella had six children together before her death in 1465. He remarried Joanna of Aragon, a daughter of John II of Aragon, with whom he had one surviving daughter. Upon his death in 1494, he was succeeded by his eldest son, now King Alfonso II of Naples. Alfonso had married Ippolita Maria Sforza in 1465 with whom he had three children. King Charles VIII of France invaded Naples in 1495 and Alfonso quickly abdicated in favour of his son, now King Ferdinand II of Naples. Alfonso died not much later. 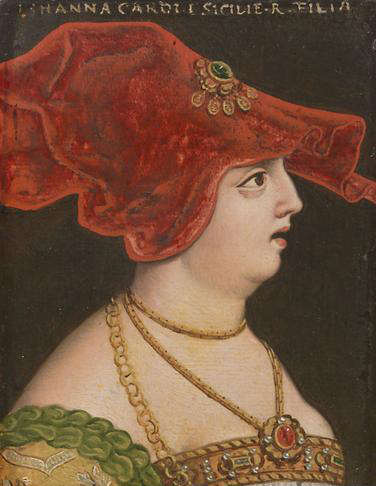 Ferdinand managed to get his Kingdom back, and in August 1496, he married his 18-year-old half-aunt Joanna of Naples. He fell ill the next month and died on 7 September 1496. He was succeeded by his uncle, now King Frederick of Naples. Count of Barcelona, King of Castile and León, King of Naples and King of Navarre by his daughter Joanna and she, in turn, was succeeded by her son, who became Charles V, Holy Roman Emperor. The Habsburg rule lasted until 1734 when both Naples and Sicily were captured by a Spanish army and Charles, Duke of Parma, a younger son of King Philip V of Spain was installed as King of Naples and Sicily from 1735. 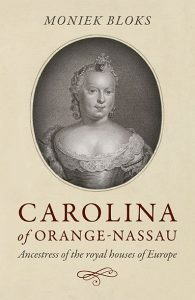 He was married to Maria Amalia of Saxony in 1738, and they had 13 children together, though not all lived to adulthood. Charles was not known by a regnal number. Instead, he was known as Charles of Bourbon. When Charles became King of Spain in 1759, he left Naples and Sicily to his younger son Ferdinand. Ferdinand had married Maria Carolina of Austria, a daughter of Empress Maria Theresa, in 1768. Ferdinand was deposed twice from the throne of Naples. Once by the revolutionary Parthenopean Republic for six months in 1799 and again by Napoleon Bonaparte in 1805. On 8 March 1816, he merged the Kingdoms of Sicily and Naples into the Kingdom of the Two Sicilies.